By now, many children are ready to trade in school days for pool days. Who can blame them? Summer in New England is the best time of year. For parents, grandparents and caregivers, the transition to summer comes with responsibilities. Talk to each other and your children about the rules for pool safety now. Make your plan for watching children and keeping them safe. This is the most important of all planning. Drowning can occur quickly and silently, within a matter of seconds. 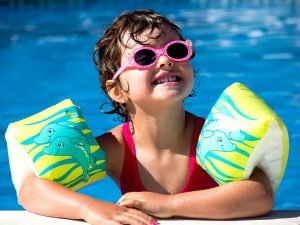 Drowning is a leading cause of injury death for young children ages 1-14, claiming the lives of three children every day in the U.S., according to the Centers for Disease Control and Prevention (CDC). There are others who survive but are left with severe brain damage and long-term disabilities. Pool Fence and Lock. If you have a pool of your own, there are state requirements you must meet. First, your pool fence should be at least four feet tall and be self-closing and self-latching. It must open outward. Read more tips on keeping a safe pool fence. Pool Alarm. Another idea is a pool alarm that notifies you about activity near your pool. A pool alarm is required for pools that are surrounded by three walls of fencing and a house serves as the fourth. Layers of Protection. Think how you can slow down young children heading to your pool, beyond just your pool fence. You could add an extra lock, an extra fence or shrubs. Never Leave a Child Unattended In or Near Water. Supervising your child in the pool is your most important job this summer. Bring your cell phone to the pool in case of emergency, but set it aside and focus solely on your child. Buy a watch you can keep with you at the pool to check the time. Watch for Fatigue. Make sure your child does not become tired and vulnerable to drowning or injuries. Take a few minutes of rest or leave the pool for a while. Swim With Your Child. For young children, keep them in your arms and just let them get exposed to the water. As they get a few years older, you can practice “touch supervision” with them, where they are never more than an arm’s length away. Put a life jacket on young children who do not know how to swim. Swim Lessons. Sign your kids up for swim lessons so they are familiar with the water and learn the important life-saving skills they need to protect themselves. At the same time, sign yourself up for a CPR training course. Baby Pools. Empty and turn over baby pools after use. If you don’t, a young child could easily climb and fall in. Inspect Pool Area. If you have a home pool, glance around. Is the fence in good condition? Is there any glass out (glass bottles or even glass furniture) that could break and cut someone? Also look for broken equipment, such as pool ladders. Make it a practice to walk around the entire pool area at the end of each day and remove any hazards. Keep Away from Pool Drains. Keep children away from all pool drains, pipes and other openings to avoid entrapments. Make sure your children are not wearing any loose jewelry, hair accessories or clothing that could get caught in a pool drain. Diving Boards and Slides. Diving boards and slides cause a large number of swimming pool injuries. Do not install them and consider uninstalling them to make your pool safer. If you have them, make sure you have the recommended level of water in your pool to support them. Put out traffic cones around them and tell kids they are only for certain times, such as when you have more adults at the pool. Friends’ Pools. If you drop your child off at a friend’s house, always ask if the family has a pool that is fenced off and look around at neighbors’ homes. Tell the parents who are supervising your child that you prefer the kids play in the sprinkler when you are not there. The Boston personal injury lawyers at Breakstone, White & Gluck have over 100 years combined experience representing those who have been injured by negligence and wrongdoing. If you have been injured, learn your rights. For a free legal consultation, contact us at 800-379-1244 or 617-723-7676 or use our contact form.